I purchased my 2011 Jeep Compass new in the fall of 2011. I had researched several smaller SUV type vehicles with 4 Wheel drive, and most were very expensive. The Jeep Compass came with all the bells and whistles for a much more reasonable price. I was concerned about the quality of the interior, since previous Compass models had bad reviews regarding the appointments. However, upon test driving the car, I found it very well appointed and the interior to be very comfortable as well as pleasing to the eye. The 4 cylinder engine has lots of pep, it rides nicely, very smooth and can handle even the toughest of weather. The exterior is also pleasing to the eye, the SUV looks more like a blown up station wagon vs. a jeep, but it still has that Jeep look in the front end. Overall, it's been a very reliable vehicle. My Dad & I took the Compass up to the ATV park. We drove up mountains and dirt roads, bouncing around and laughing like crazy. It's not really an off road vehicle, but we had fun. Great interior, lots of options including heating seats, radio controls on the steering wheel. Four wheel drive is easy to engage. Vehicle also has traction control, full air bags, fold down rear split seats. Heated side mirrors for the snowy days. The compass has always started right up for me, and performed well on short trips and long trips. The things on the sides of the vehicle seem to bubble and crack within a year. The four wheel drive control is in a very odd place, underneath the center console, you have to push the center console back to engage it, it's also a cheesy level that doesn't quite feel secure. The air conditioning system failed within 3 years of ownership, but thankfully was covered under warranty. It could use a 6 cylinder motor in it- while it has pep once it gets going, something a little bigger would be nice. I like my Jeep Compass for many reasons. I like the power behind the engine. I like that off road features. It handles well in bad weather. And its very stylish. This vehicle was fun driving to Galveston as we were able to drive it on the sand at the beaches and save tons of gas when we travel. My top favorites about this vehicle is first of all the "get up and go" behind the engine. I love that I can fit this car in tight places like a normal compact car and drive it like its a 4x4, its like a transformer! Another thing that I like is that its good on gas mileage. I also appreciate the fact that I can fit a lot of people in this care, seats 5. And the storage in the hatch back is unbelievable all while keeping its small sleek design. I cant say have any real negative things to say but I guess if I have to list something it would be that this vehicle is quite loud. Also there is not a lot of leg room in the front. Another thing is that fabric on the seats are hard to clean. And I don't have the option to turn off the passenger side air bag. The roll over warning also kinda frightens me. I have had my car since 2007, and it has only had very minor issues associated with it. It has been super dependable and very easy to keep up. I think that it also gets good gas mileage. Another thing I like about my car is that it is small yet still an SUV. This gives ample room for moving things, bikes, etc, while also making it easy to maneuver and park. One of the few things that I do not like about my car is the color. It is silver and in general I prefer black cars. It is not very fast either, but the brakes and handling are very good. I live in the Midwest and this car is also great in the snow. I see other people sliding around in the winter, but I feel safe when I drive my car in the snow. I wish that my car had a sunroof, but that is a minor issue. The backseat is a little small compared to what I would want. People also have trouble finding the door handles in the back of the car, so that might bug some people. Driving around with the windows down just enjoying life! My favorite thing about my car is that it has been super dependable and very easy to keep up. This has been nice from a couple of different aspects, including safety, convenience, and also from a money standpoint. It also gets good gas mileage which is important for cost. In my mind, my car is the perfect size; it is small and easy to maneuver and park, but it is also an SUV so there is plenty of room for transporting things. My car handles very well, is great in the snow, and feels smooth to drive. There is room in the trunk for a spare tire which comes in handy in certain situations. The seats are very comfortable to sit in, and the back seat can come down and make a small area to lay if needed. The car is also good at adjusting to temperatures quickly. For example, in the winter it heats up very quickly and in the summer it can cool down just as fast. I do not like that my Compass came without a sunroof, as I think that sunroofs are very fitting for Jeeps. I do not like the color of the car as much as some other options that were available. The car is kind of slow at accelerating; I have driven other V4 engine cars and they seem to accelerate much faster than my Compass does. I wish that the back seat and trunk had more space, and depending on who sits in the back seat it can become quite cramped. Although the car gets good gas mileage, the tank itself does not hold much and I feel like I have to refuel quite often compared to other people. I would also prefer leather seats over the current cloth seats I have. The Jeep Compass, a four-door compact crossover, was one of Jeep’s first forays into the world of crossovers and it was the first Jeep whose base model was front-wheel drive. The Compass replaced the Patriot in Jeep's lineup and its platform is a slightly longer and wider version of the one used by Jeep’s Renegade. Because this vehicle has grown in its second generation, it now sits below the Grand Cherokee and Cherokee but above the subcompact Renegade in Jeep's lineup. The latest generation made its debut in 2016 as a 2017 model, and brought a slightly larger footprint as well as a notable increase in refinement and design to the Compass nameplate. Changes include a seven-slat grille and reinterpreted wheel well arches. Cloth seats are standard, with optional vinyl or leather available. 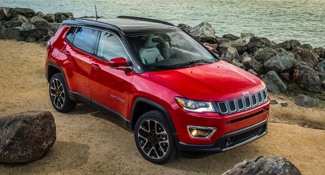 Overall, the Compass was redesigned to more closely resemble both the Cherokee and Renegade. Jeep’s second-generation Compass also added a new trim level: the off-road capable Trailhawk. The rest of the Compass lineup was comprised of the base Sport, the Latitude, the Limited and various special-edition models. Any of the four main trim levels could be ordered with either all-wheel drive or front-wheel drive, except for the Trailhawk, which came only with a more sophisticated all-wheel-drive system. The Compass also has an automatic engine shutoff feature that's designed to provide better fuel economy, but this feature may be turned off if desired. A single engine choice was available: a 180-horsepower, 2.4-liter “Tigershark” four-cylinder engine. Sport and Latitude models paired this engine with either a six-speed manual transmission or a six-speed automatic. The higher-end Limited and Trailhawk both had nine-speed automatic transmissions. Available features included 18-inch aluminum alloy wheels and a panoramic sunroof, LED front headlights, a Uconnect 3 infotainment system with one of three screen sizes (5, 7 or 8.4 inches) which is compatible with Android Auto or Apple CarPlay, and a navigation system. Other available options included forward collision warning, a backup camera, front and rear parking sensors, and a blind-spot monitoring system. The Trailhawk has additional goodies, too, like tow hooks and skid plates. It also adds leather seats with red trim, a blacked-out roof and unique alloy wheels. The Latitude trim level has available exterior options such as automatic headlamps and cornering fog lights in addition to heated, power adjustable side mirrors, roof rails and tinted windows. On the inside are features like ambient lighting, illuminated mirrors and keyless entry, as well as a leather-wrapped shift knob and steering wheel. The transfer case offers the following modes: auto, mud, sand and snow, plus the Trailhawk boasts a “rock” mode. The Compass has a 4WD lock mode that mimics four-wheel-drive by starting in second gear, but is not true 4WD. None of the Compass models has had true 4WD, but rather all-wheel drive with this mode. The original Jeep Compass had a 2.4-liter four-cylinder engine that made 172 horsepower. Base models had front-wheel drive, while Jeep offered optional Freedom Drive I and II electronically controlled all-wheel-drive systems. Standard safety features included antilock braking systems with brake assist, electronic stability control and side-curtain airbags. Basic trim packages included the Sport, Latitude and Limited. The Sport trim was the base model and it came with features like17-inch alloy rims and cloth seats as well as manual roll-up windows and locks. Also standard was an auxiliary audio input jack and a 12-volt power outlet. There was also an outdoor temperature gauge and vinyl flooring. Power windows and locks were an option, as was AC and an upgraded sound system. The Latitude had power windows and door locks, keyless entry and a security system. The Limited was the luxury model, with leather-trimmed seats, remote starter and available sunroof. The Compass did not qualify for Jeep's self-ascribed “Trail Rated” badge until 2011, and it was originally marketed towards first-time Jeep owners and those who typically drove on paved roads rather than the off-road buyer. In 2011 the Compass got a refresh that was aimed at capitalizing on the popularity of Jeep’s Grand Cherokee. Thus, the exterior styling at the front was significantly updated to resemble the Grand Cherokee. The suspension was revised to raise the ground clearance by an inch and offer better handling. Jeep also added more standard items to the interior. Option packages include the off-road Freedom Drive II which had a continuously variable transmission with a low-range setting. This model also had all-terrain tires mounted on 17-inch aluminum wheels as well as skid plates and Four-wheel drive. The three trim levels remained the same, and the basic model now enjoyed standard AC, power windows and door locks, heated power side mirrors and keyless entry as well as fog lights, cruise control and tinted windows.